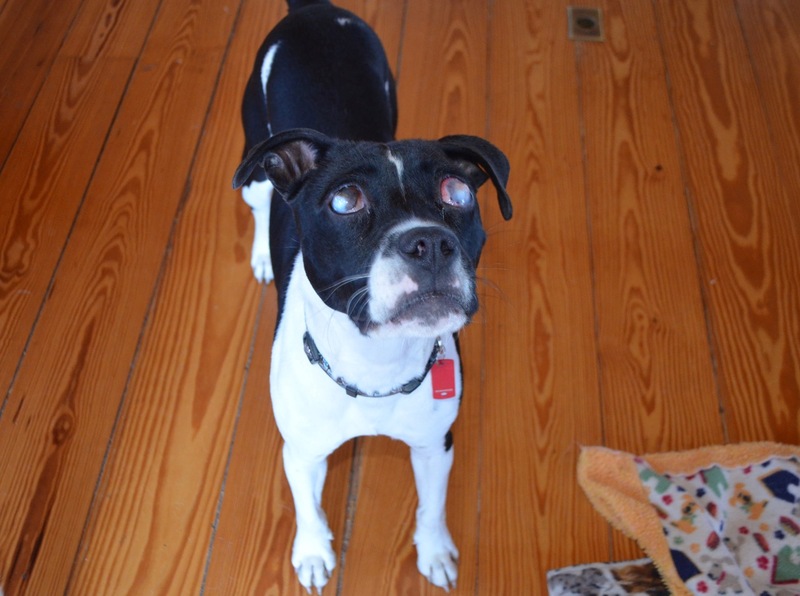 You are here: Home / Dogs / Please Welcome Blind Millie! This young lady, named Millie, arrived a few days ago from Arkansas. That’s her classic look — she follows me around the house, staring?up at me like that. You can tell those eyes are in desperate need of medical attention. 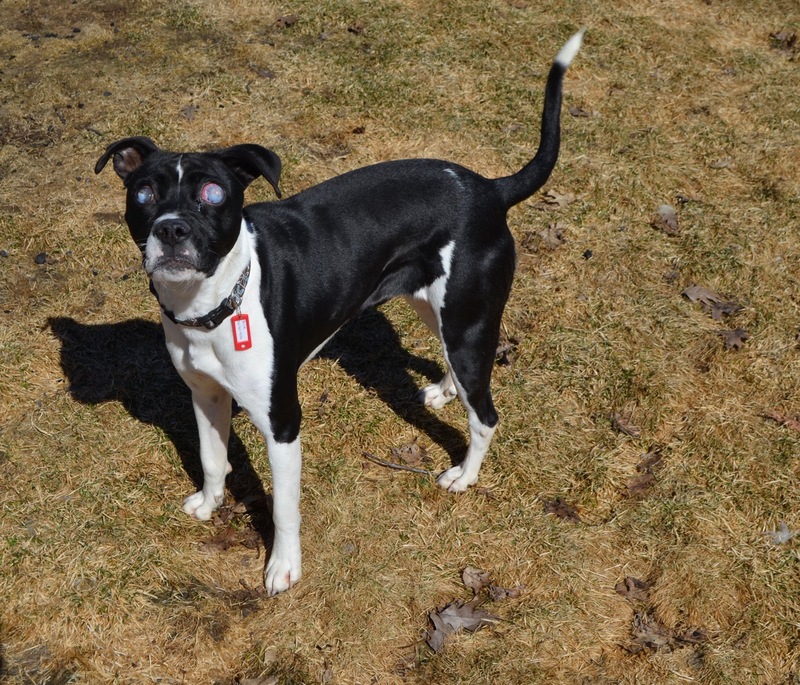 She?is an 18-month old Boxer mix who was adopted out by a local shelter as an 8-week old puppy in front of a feed-store, and she clearly already had eye problems then (we’ve seen photos of her as a puppy). 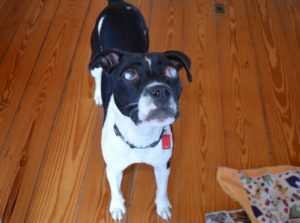 The adopter turned out to be a very elderly lady who kept Millie as an outside-only dog and did nothing about her eyes. The lady just went into a nursing home in the last several weeks, Millie was returned to the shelter, and a rescue group we’ve worked with in the past (who sent us Tanner, among others) asked if we could take her. 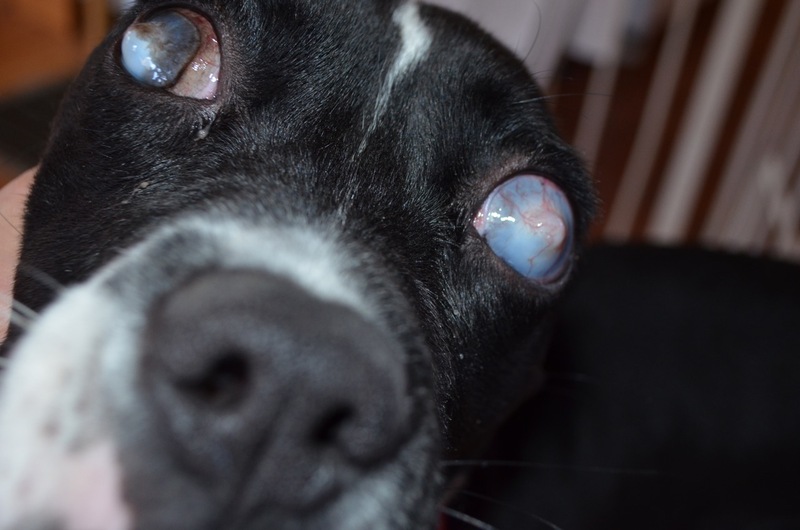 We have an appointment for Millie with our veterinary ophthalmologist this week in Burlington. Darla has taken to chasing Millie away from the ramp to the front porch, which Millie just loves as a “catch-me-if-you-can” game, jumping and twirling as she spins away from Darla. A minute later she’s back, trying to taunt Darla into going after?her again. Millie leaps into the air, boxes with her front legs, and does lots of play-bows to coax them into playing. Both Tanner and Darla are getting plenty of exercise now that this high-energy girl has arrived. As for breeding, we’re not sure what else she’s part of (Holstein? ), though she has the classic undershot Boxer jaw. I didn’t know until I started looking online this weekend, but there are people who breed black Boxers and there are quite a few black-and-white ones out there. (See this for example.) But Millie doesn’t have that heavy jowly look, either. We thought maybe she had some pittie in her, though’that doesn’t quite seem to fit, either?- but who knows?? You can see those ulcers are just popping out — I’ve never quite seen any that bad before. But for now, she seems happy, loves her new friends, and for a dog who spent her entire young life outside, she’s been remarkably good at house-training. I’ll have an update next week on her. Wow, those eyes are really bad. But she’s a good looking dog and I can just imagine how much fine she’s having. Now she gets to live inside with beds and toys AND has plenty of friends to play with. In the first photo, before I could see her size, I immediately thought Boston terrier because of the color. But with the head shape she could be part pittie. Anyway, she’s one happy pup now! Good luck little Millie, I think you’ve got a real sweetie pie there! Glad Millie is with y’all! We know she will be in good hands. She is beautiful. Why anyone adopts dog to warehouse them in the yard is totally beyond me. Many thanks to your contact who got her to you. She’s beautiful, except for those terrible eyes. Part Holstein, I love it! I think she’s prime minion material, too. Oh Millie –you life has now begun and you will get the medical attention you so desperately need. Thank you RDF! Oh, a young one too! Millie is adorable. 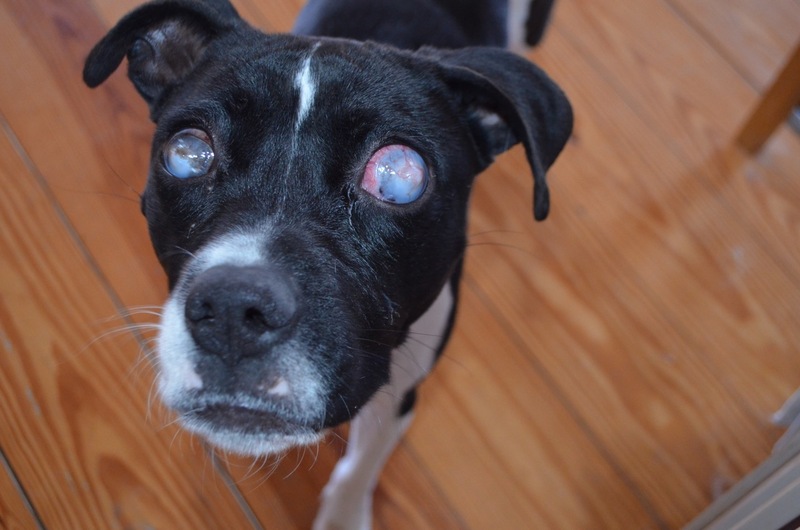 She seems so sweet… imagine how much sweeter she will be once her eye problem is taken care of. Hurrah for Rolling Dog Farm! Hurrah for Steve and Alayne! A welcome and sweet addition to your family! Could have done w/o the closeup of the eyes though Steve — just ate! LOL. So glad Tanner has a new buddy. I pray that eye situation works out so she can be comfortable now. Bless you guys for taking that little sweetheart! Another great addition to your family! What a good looking girl she is in very good hands now. God bless you guys.